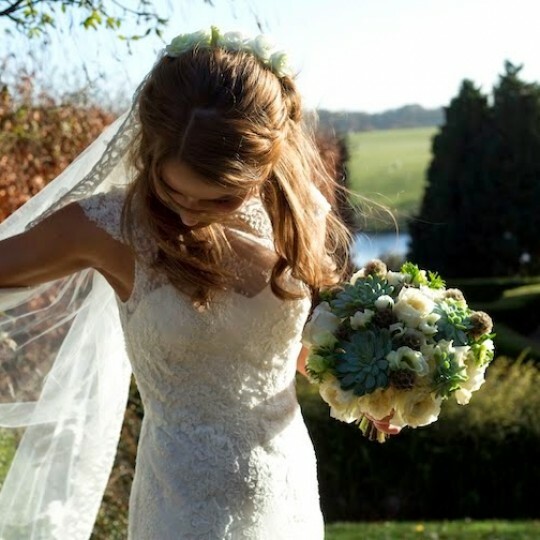 Lisa and Mark's gorgeous white winter wedding at Caswell House - Joanna Carter Wedding Flowers | Oxford, Oxfordshire, Berkshire, Buckinghamshire and London. 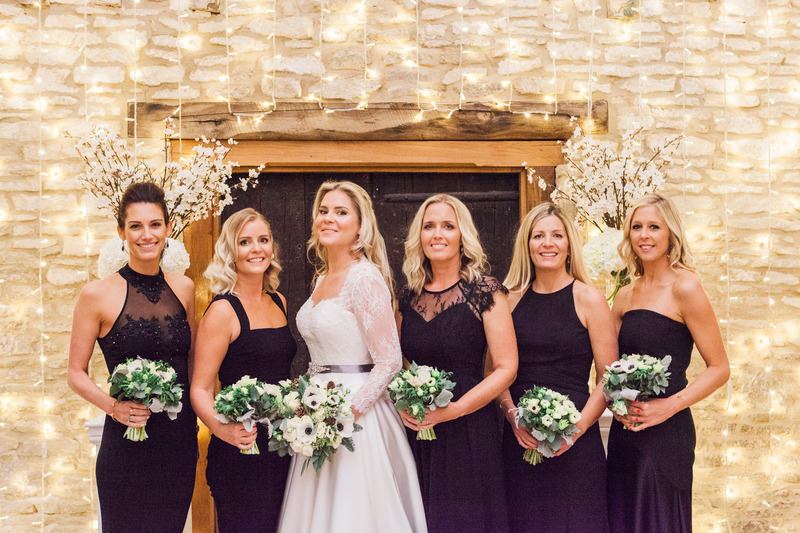 Lisa and Mark’s wedding was held just before Christmas in the lovely setting of Caswell House, a series of beautifully converted barns on the edge of the Cotswolds. 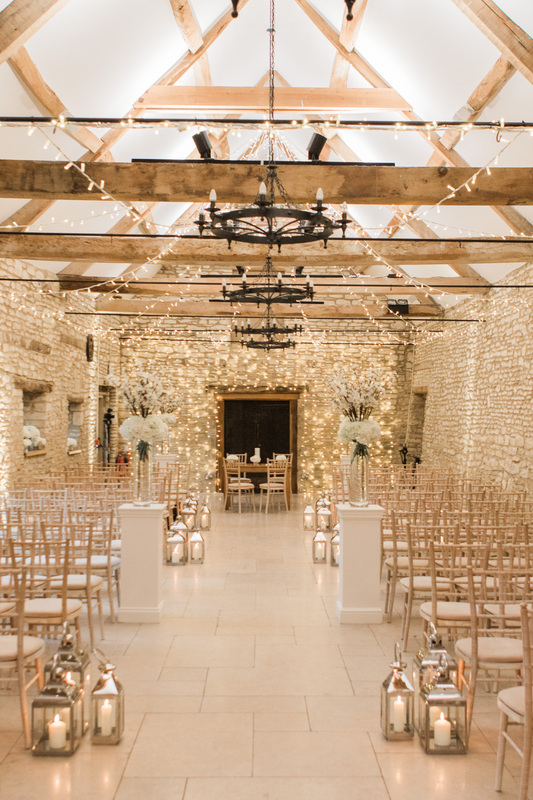 The venue was filled with twinkly fairy lights and masses of lovely white flowers. 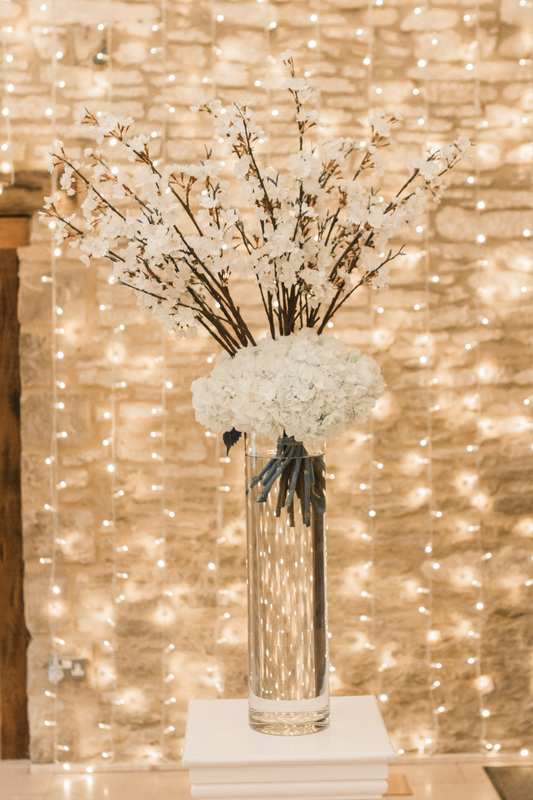 Lisa was keen to incorporate blossom through out her wedding and as it was out of season we tracked down a really good quality, realistic faux blossom to make sure it could be a focal part of her day. 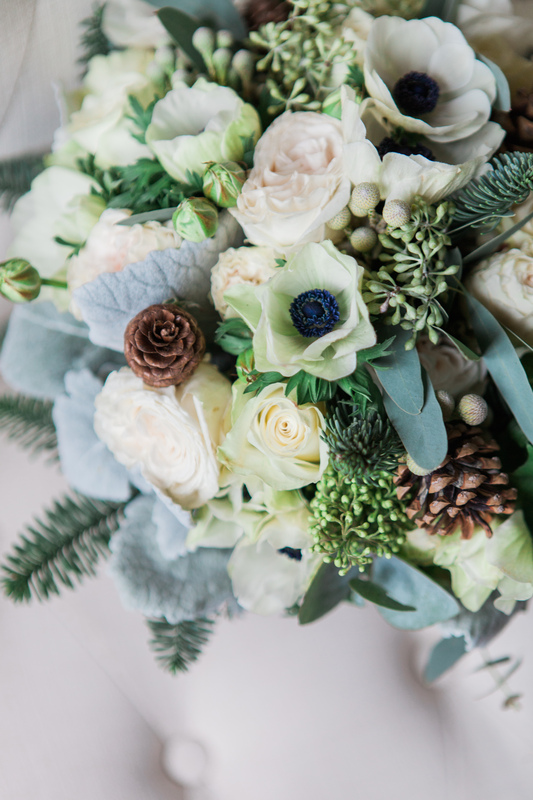 Lisa’s bouquet was one of my favourite of the whole year, with tiny pine cones nestled amongst ivory roses, beautiful anemones with black centres, spray roses with the subtlest hint of peach, soft grey brunia berries and seasonal spruce alongside skimmia, eucalyptus and senecio. 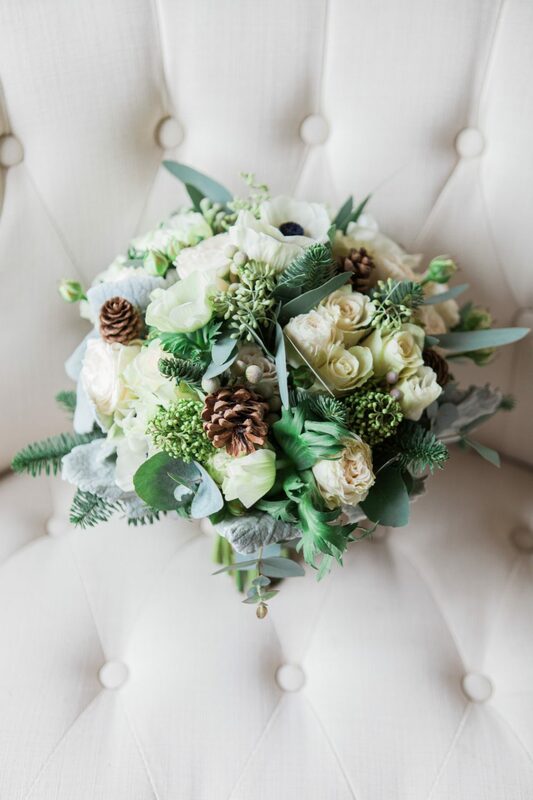 A gorgeous mix of ivory, green and grey. 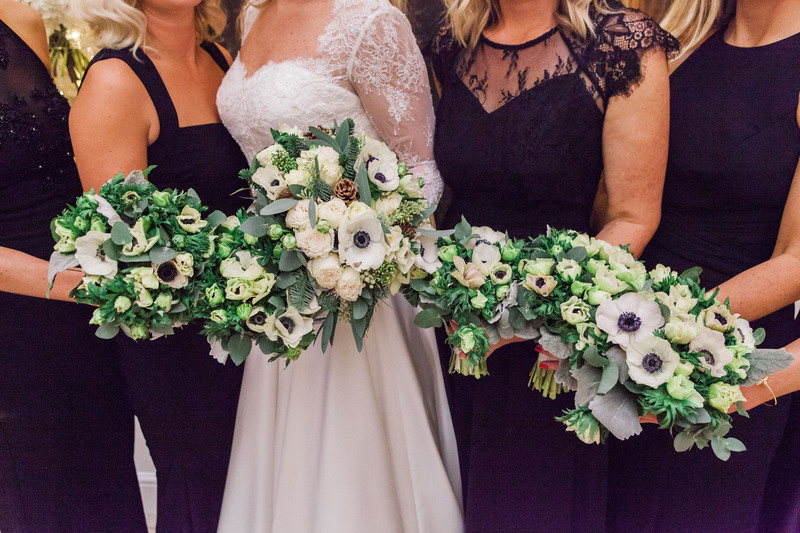 Lisa’s bridesmaids wore elegant black dresses and carried simple bouquets of anemones with the black of their dresses reflected in the centre of each anemone. 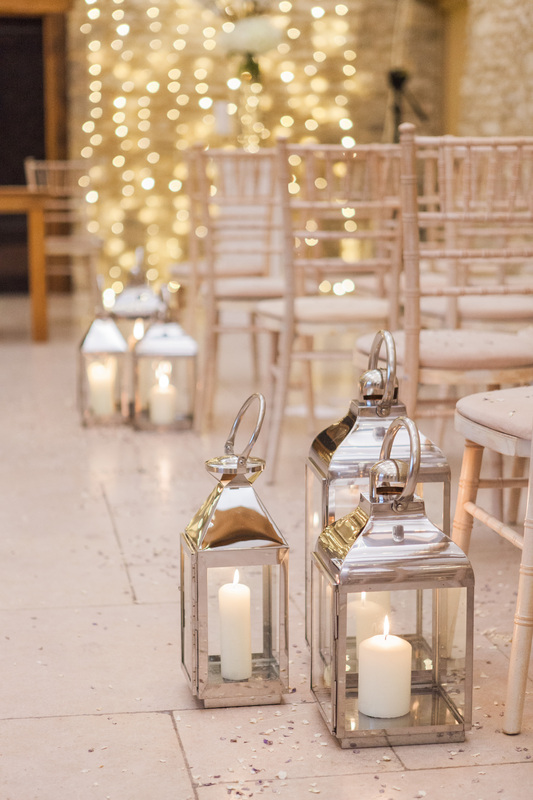 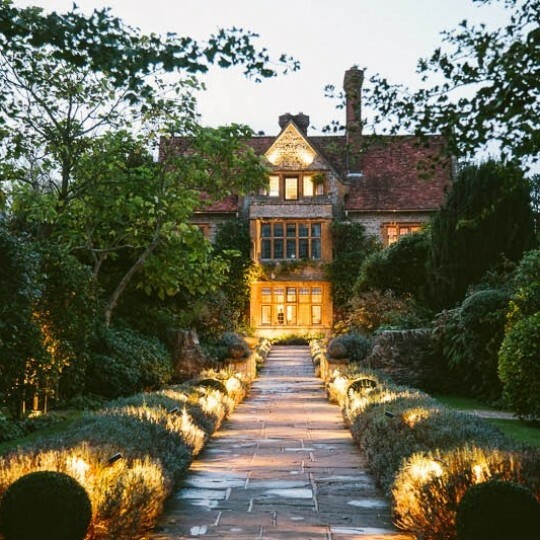 The Barn looked stunning swathed in fairy lights, which we accessorised with plenty of lovely silver and glass lanterns that started off in the aisle and were then moved to the window sills of the barn in time for the wedding breakfast. 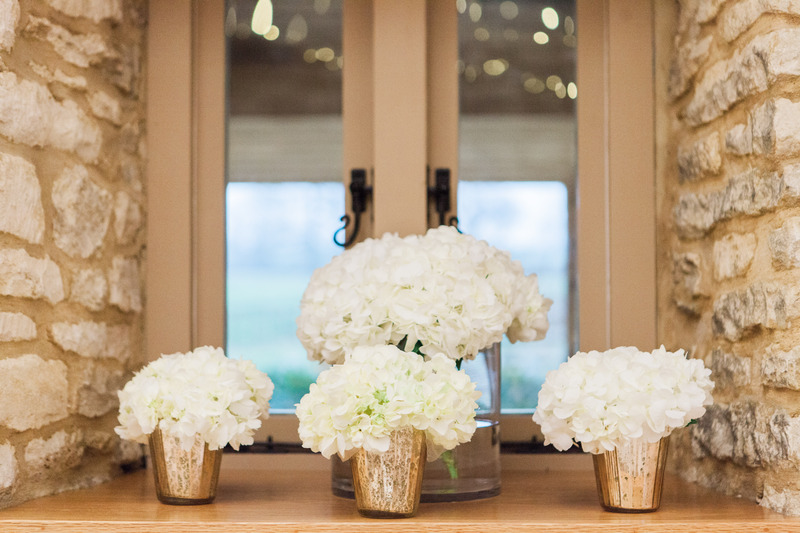 We placed tall slim vases of blossom and hydrangea on plinths at the top, middle and bottom of the aisle and placed low glass cylinder vases filled with domes of hydrangea on the window ledges. 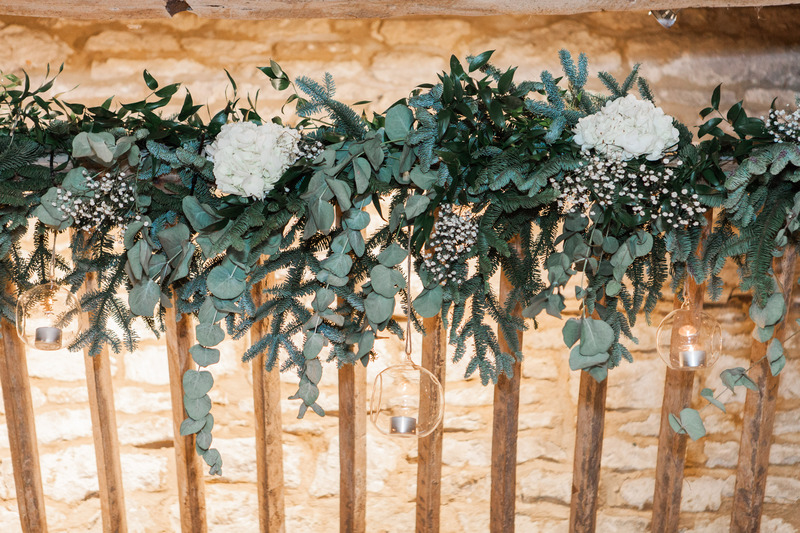 We decorated the lovely hay byre at the rear of the room with a long flower and foliage garland which we then hung clear glass tea lights from to add even more candlelight. 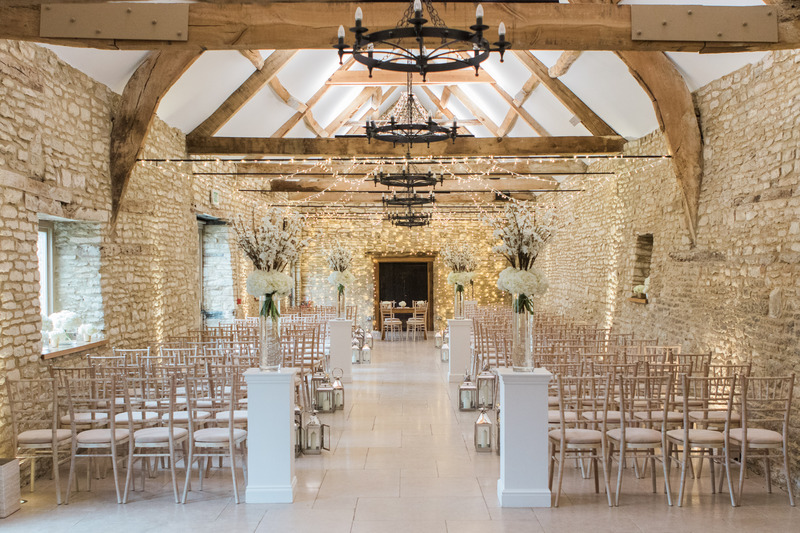 Following the ceremony the tall glass vases and low cylinders from the window sills were moved to the dining tables ready for the wedding breakfast. 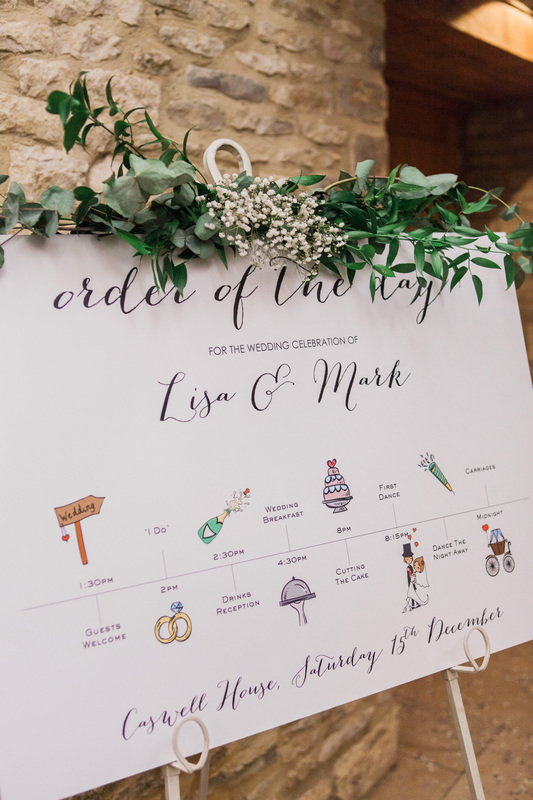 As a final flourish we added a small foliage garland to the Order of the Day sign. 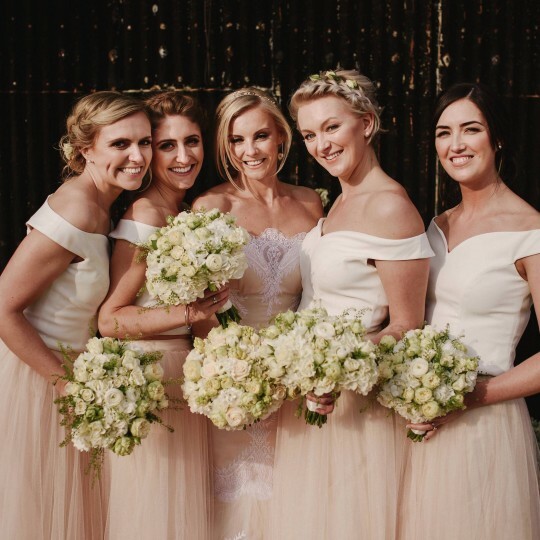 Thank you Lisa and Mark for letting us be a part of such a stunning winter wedding.